December | 2015 | ReadWriteLib Reads! Based on the podcast of the same name, Welcome to Night Vale: a novel is just as delightfully odd and furthers a couple of plot lines from the podcast while still being self-contained as a story. Now, since I listen to the podcast and was up-to-date when I began the novel, I found it easy to get hooked since I already love the premise and know most of the characters in the book. I cannot say if it would be harder to read without having listened to the podcast first. 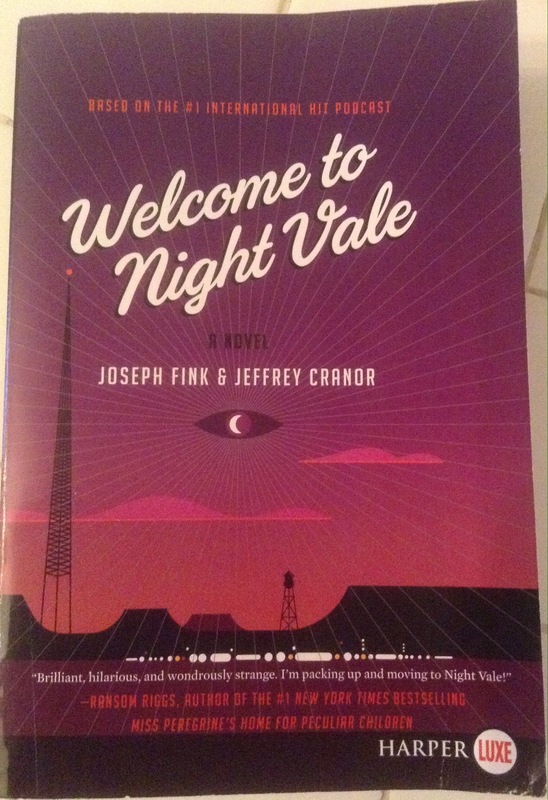 Welcome to Night Vale is absurd and bizzare, which the book portrays right from the start so it’s apparent to the reader what they are in for. This is part of its charm but it might be too odd for some. Let’s begin with the obvious difference: the podcast is presented as community radio news by Cecil with occasional guests, so he is the voice of Night Vale, covering all of the current events and oddities of that day. I was concerned about how the novel would be structured but Joseph Fink and Jeffrey Cranor, who write the podcast, have kept the feel the same which is an impressive feat. While most of the novel is a typical linear story, Cecil gets occasional chapters throughout that are written as a script and in a different font to help distinguish them. While some aspects of the podcast aren’t possible in book form, such as the weather (Cecil plays a different song for it in each podcast–another nonsensical feature), it feels similar enough and, for podcast listeners, Cecil’s voice likely narrates those sections as you read them to yourself anyway. It’s a smart format because it ties the audio nature into the book format and likely delights the fans and might encourage new ones to listen. What I love most about Welcome to Night Vale is the creativity behind it. It is a town with it’s own set of rules, physics, and time (or lack or it). Everything behaves differently from our world, including their society and norms. The public dog park is restricted to citizens and their dogs, as hooded figures roam in it. The library is feared as books are dangerous and forbidden, plus the librarians are monstrous and vengeful (this aspect saddens me since as a librarian myself, we need all of the encouragement and help getting people to read these days–despite it being tongue-in-cheek). A glow cloud moves into town and becomes head of the school board, radio interns always die gruesome deaths while reporting stories, and angels are real and wander the town but not believed in because the government does not recognize them as real. These are the underlying assumptions in the novel, along with other Night Vale facts and precedents, that for readers who have not listened to the podcast will need to suspend their disbelief for and just keep on reading. The absurdness, and creativity, is what makes it so delightful. All hail the glow cloud. The novel itself follows characters that aren’t main ones in the podcast. We learn more about Jackie who runs the pawnshop, as well as Diane and her son Josh. The story is all about family and what we do for the ones that we love, which in itself is a great tale that happens to take place in Night Vale. It’s easily relatable and enjoyable. Also, the two main characters are female, which is a refreshing change since the Night Vale podcast is narrated by Cecil. Don’t get me wrong, Cecil is an excellent narrator and his voice is wonderful but it was a nice surprise to have the female characters running the novel, as I had assumed that Cecil would also be the point-of-view for the book. Curious, or compelled, to visit Night Vale? All podcast episodes are available on many podcast apps (iTunes, Stitcher, Overcast) or now on their YouTube channel. Plus, the cast also does live shows worldwide. Recommended? : Yes, especially for fans of Night Vale since it explains and resolves some questions from the podcast. Plus, Cecil assumes, in recent episodes after the novel’s publication, that the listener has read the book and says no more about certain topics. If this review sounds interesting, then pick up the book or give the podcast a listen. Welcome to Night Vale is a unique taste but for those who enjoy it, they really enjoy it. The podcast and novel aren’t for everyone but are worth a try because they are well-crafted and very professional for being a self-sustaining endeavor, listener-supported, without ads or commercials which is impressive since not many podcasts these days can say that. I would love to hear other people’s opinion about the novel, for both listeners and non-listerners of the podcast. Please leave comments below. Not long ago, in my public library, I noticed that one of the staff picks was The white tiger by Aravind Adiga, which I read in college for fun and fell in love with. Having not thought about him in years, I searched the library catalog and amazingly found that he had written a book of short stories and another novel. After leafing through the short stories, I remembered reading it a while ago but his latest novel Last man in tower was new to me so I checked out the eBook. Loving the first novel, this one had a lot to live up to and, for the most part, did. What I remember loving about Adiga’s writing is the vibrant, tangible descriptions of India–not just the typical sights and sounds but even food and small details. Last man in tower did not disappoint in this regard. Though I haven’t visited, I feel like he has taken me around India in his writing. Adiga’s characters are also another feat of his great ability. They are real and complex on the page, which makes it all the more believable and nearly a first-hand experience instead of a work of fiction. While the overall events are fairly mundane, the premise of the story propels it, along with the concern for the characters. As a reader, buy-in is important to me; if I don’t connect with and care about the characters then it’s not an enjoyable. The plot wasn’t intriguing to begin with but as the novel went on, I was hooked. In a poorer neighborhood in Bombay, a gated community called the Society, is offered an exorbitant amount of money to sell their apartments and the grounds to a famous local builder who want to demolish everything and build new luxury housing. It’s a deal of a lifetime. Who would refuse? Well, it turns out, a few people including a retired science teacher; he will not take the money no matter what. The novel turns into lesson in peer pressure and how far people are willing to go, as no one can get paid unless they all agree. For most of the novel, neighbors, once friendly and generous, turn on each other to get the remaining hold outs to cave and progress to violence in order to get their way and sleep well at night. 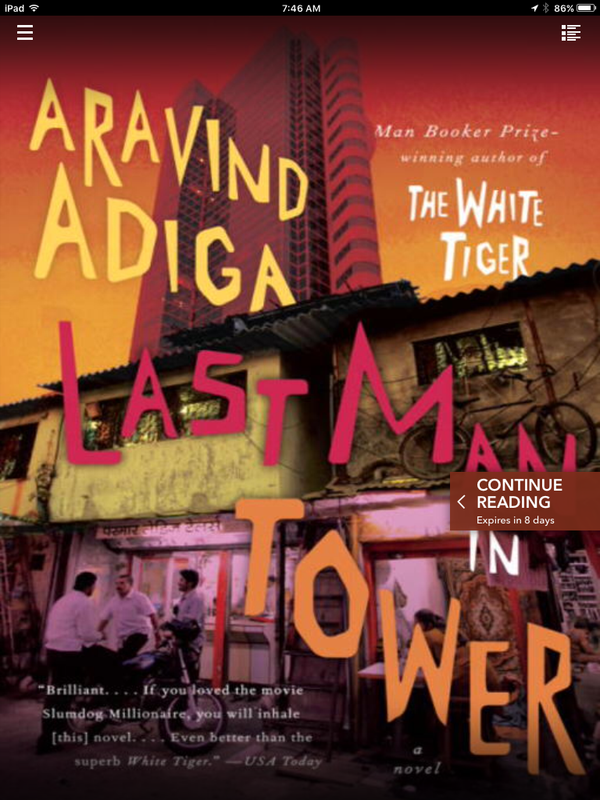 While Last man in tower was good, I preferred his first novel since it had more action and adventure. However, this certainly took more work to pull off, with all of its wonderful characters and subtle yet sophisticated story, following various characters trying to achieve the same goal in their own way and mindset. Recommended? : Yes, especially for fans of Aravind Adiga. If the premise sounds intriguing, then start with this one first and then read the others. Otherwise, try The white tiger if you crave more thrills. For anyone who like short stories, check out his Between the assassinations short sotry collection for a mix of everyday life in India among the common folk with bizarre characters and odd tales interspersed; it’s a fun, easy read and will show off Adiga’s amazing writing ability the quickest. As I write this, I long for his next work of fiction. It’s already been 4 years since his latest novel…I hope it’s not too much longer for whatever he’s working on now. Until then, I might have to start looking for similar Indian authors to keep enjoying my travels via pages.